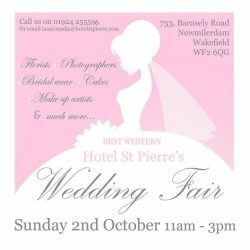 We are very excited to be doing our first Wedding Fayre of the season at Hotel St. Pierre BW, Newmillerdam Wakefield. We would be delighted if you could join Thompson Towers Wedding, Party and Event Hire at this beautiful venue. Our company is based in West Yorkshire and is located within the Leeds and Wakefield area. We know how important it is to provide an exemplary service based on trust and reputation, which is why we are inviting you to come and meet with us and discuss your vision and requirements for your special day. Take a look at how we can make your venue beautiful with our backdrops, 4FT LOVE letters, uplighting, Candy Carousel and more, see for yourself the quality we can provide. See you there – Thompson Towers. ← Coming soon… Our beautiful LED MR & MRS 4FT Letters stunning for your special day.